MultiBrief: Does your school facility need a makeover? Does your school facility need a makeover? Does your school facility need a makeover? According to this 2012 report by the National Center for Education Statistics, 53 percent of American schools are due for such an upgrade. Upgrades can be done in ways to fit almost any school budget. The key for school principals is to stretch the financial resources they have to provide the biggest rate of return possible to enhance student learning and overall school culture. At a recent visit to my child’s middle school, the principal took me on a tour of recent upgrades made to their front entrance lobby. The building, built quickly and cheaply in the 1970s, has long since reached the status of obsolete in our community, yet we as a voting community just aren’t ready to support a project to build a new middle school. Like so many other principals from coast to coast in this situation, the principal had to look for small ways to make facility upgrades that would have a big impact. The lobby project was this kind of a project. Much to everyone’s surprise, the principal opted to use a beach wood-tile flooring for the front entry, a move right out of the HGTV playbook for trendy home makeovers. The tile is a stark contrast to the multicolored industrial tile that graces the remaining 99.9 percent of floor space in the building. This new floor, along with a few fresh coats of paint and a redesigned front desk that was primarily built in-house by district facilities staff, brought new life to what had been a long forgotten space in this school. The principal explained that to me that his goal was to make parents feel more welcome and comfortable when they visited the school for meetings. He wanted to set the right tone and the best possible first impression. Surprisingly, I think his strategy is going to pay off. For the past 13 years, I have been fortunate enough to work at a New Hampshire high school that has operated in a brand new facility. Built in 2006, the facility replaced a nearly 100-year-old brick structure that was originally built as a private seminary school. The building had long since become obsolete, and it took nearly a decade for the community to generate the support it needed for a building project. Capitalizing on state funding opportunities at the time, the building was constructed on time and under budget — a rarity with any public works projects these days, it seems. There is no question that I have watched a monumental positive cultural shift in my school community over the last 13 years, but I can’t necessarily say it was due solely to having a new facility. Although a new building certainly helped, it was actually changes to our internal infrastructures that likely can be attributed to the positive changes that have taken place. Principals should take note, because these changes can be done in many cases with little or no increase in funding resources, yet they may have a huge impact and give schools a sense of a total school facility makeover. In a recent Education Week article, educational program designer Bill Latham discussed this in more detail. He wrote, "School building conditions are clear indicators of investment—or underinvestment—and opportunity. A concentration of old or dilapidated schools in low-socioeconomic areas, for instance, stands in the way of giving students an equitable distribution of education. Doing nothing is not an option, but neither is knocking down every building and starting anew. 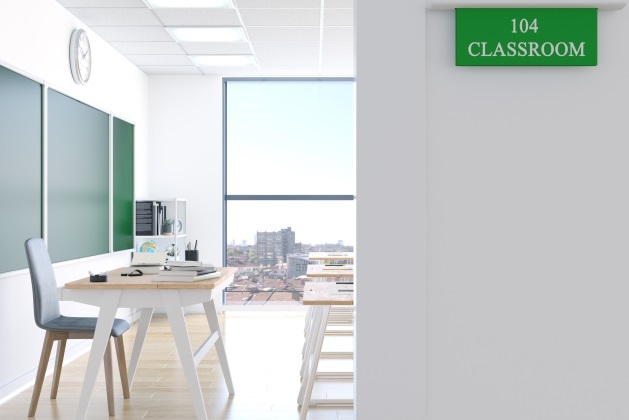 Rather than building new schools from the ground up, one of the most visible ways to quickly begin to address learning spaces is to focus on a refresh of the microenvironments—the furniture, technology, and interactions–inside the four walls." In this MultiBriefs Exclusive from August, I discussed how a move to more flexible seating options in classes can stimulate student engagement, collaboration, and an overall positive school culture. Furniture upgrades are, what Latham calls, the "low-hanging fruit" that can quickly enhance a microenvironment for students. Through an arrangement I have made with a local organization to provide me with access to "gently used" furniture from downsizing companies, I have made great strides to take advantage of microenvironment enhancements that have already provided significant return on investment. Principals, what can you do to start a makeover in your school facility today?